One of the biggest problems that I commonly see in practice is either frank or subclinical magnesium deficiency. Magnesium deficiency can cause high blood pressure, muscle tension/pain/spasm, anxiety/depression, as well as a number of other maladies. Diagnosing magnesium deficiency is often somewhat tricky, as there are no readily accessible, reliable tests that measure the body’s stores of magnesium. Treating magnesium deficiency is, however, extremely straightforward (in nearly all cases), due to the availability of, and low cost of most magnesium supplements. As a chiropractor, I often deal with patients in pain. Due to injury, muscle spasm, cramping or pain are frequently involved as amplifiers of the original injury. In a large percentage of the population, magnesium is inadequate to ensure totally normal function of the muscles, bones, joints, nervous and cardiovascular systems. The largest cause of magnesium deficiency is an inadequate intake in the diet. Either due to the food itself being deficient as a result of overfarming and failure to replace this mineral in the soil or because of inadequate intake of the foods highest in magnesium, the body is unable to keep up its stores of magnesium. The foods highest in magnesium include leafy green vegetables (the chlorophyll that makes plants green has magnesium at the center of the molecule), nuts, legumes, and meat. It is worth noting that eating raw leafy green vegetables will not result in proper absorption unless the greens are cooked at least a little bit. The fiber in the greens binds the minerals and other nutrients including magnesium, and it is only unlocked by cooking the food, which breaks down the fiber for absorption. One point that is extremely important to note is that although it is possible to maintain proper levels of magnesium by eating a healthy diet and choosing the right foods, if you are deficient, it is nearly impossible to raise your body’s levels of magnesium through food intake – this is where supplementation becomes necessary. There are countless magnesium supplements on the market, in different dosages and different forms. 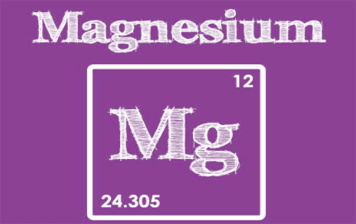 The most commonly available supplement is magnesium oxide, also known as magnesia. This supplement is the least expensive, but also the least absorbable. I personally don’t recommend magnesium oxide to any patient as it doesn’t absorb well and has very poor bioavailability. Magnesium citrate is another common supplement, often available as a pill or a liquid. The liquid is used as a purgative prior to colonoscopy, as it will cause diarrhea if taken in any but the smallest dosage. As a pill, 400mg per day is considered the RDA. There are fast-absorbing forms available, however. Magnesium chloride solution is an excellent way to get magnesium, as it absorbs quickly, is bioavailable, and doesn’t require very much stomach acid to metabolize. Magnesium aspartate, magnesium L-malate, and other chelated forms are also well absorbed, and generally, don’t cause GI discomfort or side-effects. The takeaway message is that magnesium is important for normal muscle and nervous system function; that generally, most people don’t get enough from their diet, and supplementation is usually a quick and simple way to increase your levels. Those suffering from high blood pressure, diabetes, anxiety, and depression as well as those with pain should consider taking magnesium. Importantly, though, always consult with your doctor before starting a new supplement, as there are certain contraindications to magnesium supplementation, some of which can be life-threatening. To make an appointment to discuss your nutrition status or to inquire about treatment, call (201) 569-1444.